Equifit Yoga is a yoga-based program designed to address specifics needs of equestrians. It helps riders of all ages and levels of experience to develop core strength, flexibility, better balance, stamina, and body awareness. Equifit Yoga takes in-depth care of your body, so that you can concentrate on actually improving your riding skills rather than just staying on board. And if you experience pain resulting from intense riding, falls, or soreness upon returning to ride after a long break, then Equifit Yoga has a lot to offer. Whether a beginner or advanced rider, you strive to improve your riding skills and maximize the outcome of each ride. You deserve the best value for your time and money, AND you deserve a high quality experience, both for yourself and your four-legged teammate. All your riding goals become attainable when your body is strong, flexible, and resilient, yet graceful like a blade made of the finest tempered steel; when your mind is like water that ripples when a pebble drops in, but eventually returns to stillness. Equifit Yoga helps you in this pursuit. How was Equifit Yoga born? I started to ride as an adult. I’m not really a fast learner, or what you might call a natural talented, therefore I give my practice of yoga full credit for getting me on the fast track. How fast? After 4 months of lessons I was ready to participate in the first equestrian show. I made a habit to do few poses in preparation for a lesson, or at the end of it. Some of my riding buddies got intrigued and interested to find more. The next thing we knew a yoga for equestrians program was in demand! We stared to gather for regular weekly yoga practices. Shortly, everybody had seen improvements in different areas of concern. For one rider, heels-down became more sustainable then ever before, thanks to all the stretches that lengthen the Achilles and calves. She also stopped slamming on the horse’s back when posting the trot, because her quadriceps muscles got stronger and her balanced improved. Another rider noticed her increased core strength. As a result, she has developed a more stable seat that makes her riding safer. Finally, a third rider found immediate relief from the nagging back pain she developed from a fall. Equifit Yoga emerged in response to riders’ demands for means to address issues, such as back pain, stiff neck causing tension headaches, tight shoulders, stiff hips, poor balance, tight ankles, just to name a few. 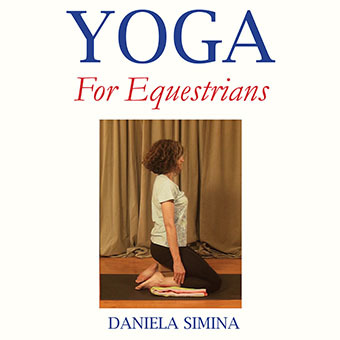 Equifit Yoga stems from the perspective of the rider who is also a yoga teacher. As such, the program offers a selection of poses and techniques to target riders’ specific needs, drawing on life-long experience of teaching yoga, and direct connection with riding. How does Equifit Yoga benefit you directly? Equifit Yoga helps you develop core strength, especially abdominal and back muscles strength. These muscles are the ones providing stability during riding, in seated work, two points, and transitions. The ability to recover balance and prevent falls is directly related to core strength. Through strengthening your core muscles, Equifit Yoga makes your riding safer. It helps you perfecting your riding posture, through exercises that strengthen the back and abdominal muscles, relax the shoulders, open the chest, and improve body awareness. Equifit Yoga provides you with the means to relieve back pain that originates from weak abdominals, poor posture, strain, or falls. Equifit Yoga creates overall body balance by stretching muscles that are primarily used in riding, such as inner thighs, calves, hip flexors etc., and strengthening areas of concern, such as abdominals and upper back. Equifit Yoga equips you better to handle the unpredictable and reduce the likelihood of falling. This program helps you develop better balance, better body awareness, and the ability to remain calm and think clearly in adverse circumstances. Equifit Yoga prepares your body to absorb the shock of the impact when falls do happen, and maintain awareness of your body positioning throughout a fall. These qualities are critically important because they enable you to smoothen the landing and get out of the horse’s way. Last but not least, Equifit Yoga helps you recover faster from injuries, and get back in the saddle much sooner. Join the interest list for Equifit Yoga and get a 14 page sample of the eBook. What makes Equifit Yoga unique? It stems from the all-encompassing perspective of a highly experienced yoga teacher who is also an equestrian athlete. As such, the teacher of the program is fully aware of very specific needs that rides have, and has that knowledge blend into a lifetime of teaching yoga and coaching athletes. We emphasizes creating balance between core strengthening and overall flexibility, more then any of the programs available. The program’s modular design includes longer practices of about 45 minutes each, and shorter, more targeted ones of about 30 minutes each. To ensure that students get the most out of the material at their disposition, the content of each lesson is delivered multimedia, as video tutorial and pdf with an abundance of pictures. The students have the possibility to first study the pdf to get familiar with the content of the lesson, learn about the benefits of each technique as it relates to riding, and then practice with the video tutorial. I tried different fitness modalities and approaches to condition my body specifically for riding, so I could improve show performance. I’ve wanted to achieve that level of body awareness and fitness that would make riding look effortless. I tried yoga before and got disappointed, so I met Equifit Yoga with skepticism. However, within a couple of weeks my riding instructor noticed a significant improvement about my heels down. Personally, I had noticed my abdominal muscles getting stronger, and with it I felt more stability and better balance in flat work and over jumps. I wasn’t sure about how yoga could help me improve position and increase stability when riding. Working with Daniela and Equifit Yoga has enabled me to be a more confident, stronger rider. This practice strengthened my core, which resulted in better balance; it stretched my legs muscles, which facilitated heels down position. I highly recommend Equifit Yoga to any rider who wants to take their riding to the next level.